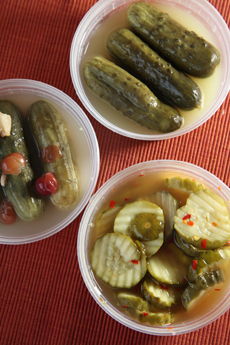 Dill pickles in three varieties: whole, whole with cranberries and horseradish and spicy pickle chips. Photo by Elvira Kalviste | THE NIBBLE. This is Page 3 of a 5-page glossary of pickle types. Some of the terms below include half sour, kimchi and kosher dill. After you’ve peeked at the pickles, take a look at our other food glossaries—an easy way to get up to speed on more than fifty different food categories. These pickles are made in a seasoned brine without vinegar. They remain refrigerated throughout the entire process, including storing and shipping. 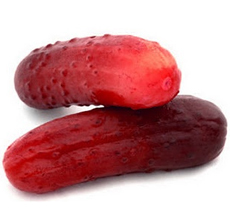 The longer cucumbers remain in brine, the more sour they become. Thus, half sours are pickled for a shorter time than sour pickles, and are made with less salt, which allows quicker fermentation. 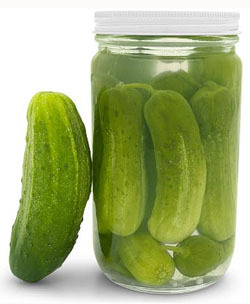 As a result, they keep their fresh, green cucumber color and are the firmest, crispiest pickles. Half sours are ideal sandwich accompaniments, and can be chopped and added to egg, macaroni, potato, seafood and tuna salads. Half-sour pickles still maintain a bright green color. Photo courtesy SKSPicklingJars.com. The method used by home-picklers, which requires heating the brine to 190°F, then placing the brine and the vegetables in Mason jars, which are immersed in a hot water bath before sealing. The pickles marinate in the jars and are ready for consumption in a few weeks. 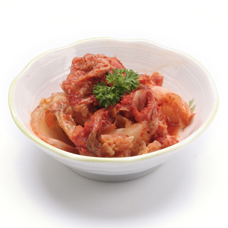 The staple pickle of Korean cuisine is fiery pickled cabbage, heavily seasoned with garlic and chiles and, in some cases, radish juice. While it is most often made with cabbage, it can include (or be made exclusively of) cucumber or daikon. A product of the southern United States, double-strength Kool-Aid is added to a large jar of pickles (whole or halved) along with a pound of sugar. One shakes the jar and and lets it sit in the refrigerator for a week. The result, a sweet pickle colored garnet red (or other artificial color) by the Kool-Aid, with more pucker. The primary consumers are children. This builds on an earlier tradition of dipping pickle spears in dry Kool-Aid mix. Kool-Aid pickles. Photo courtesy Eisforexplore.blogspot.com. These pickles may or may not be kosher, but the term refers to a “kosher style” flavor profile. This means that a large amount of garlic has been added to the brine at the end of fermentation, giving them a much more robust flavor than regular dill pickles. 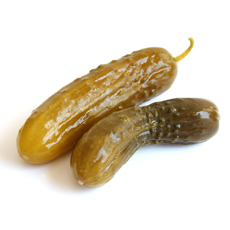 A kosher dill pickle is typically a sour pickle with a lot of garlic and dill in the brine. Compare it to the half-sour pickle above: As the pickle ages in the brine, it loses the fresh green color of the cucumber. Photo courtesy PachD.com. With the growth in popularity of Indian cuisine, lime pickles and mango pickles are more prominent in American stores. Pickled limes, however, were popular in the America of the 1800s, and are part of the story line of Louisa May Alcott’s book, Little Women. See the photo below. 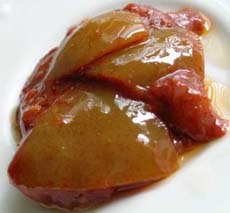 A lime pickle (pickled lime). Photo courtesy Nandyala.org. Here’s the recipe.